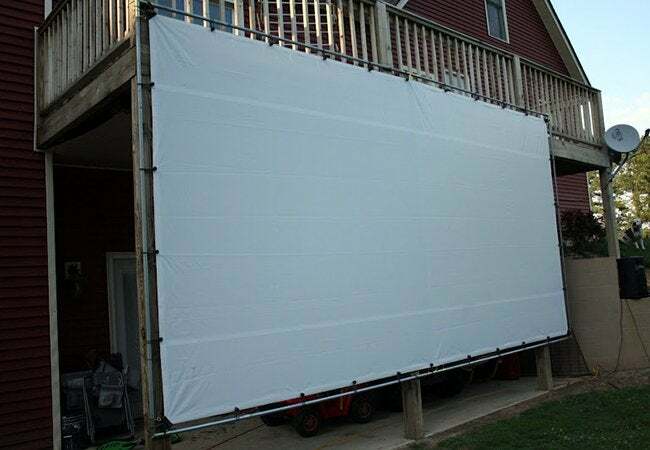 Turn your backyard into the neighborhood drive-in this weekend with inspiration from five easy-to-make outdoor projector screens. Like fireflies and fireworks, movies under the stars make for magically memorable summer nights. But if your town or city doesn’t already host nighttime screenings, you can bring the drive-in to your own backyard—minus the Hollywood budget. 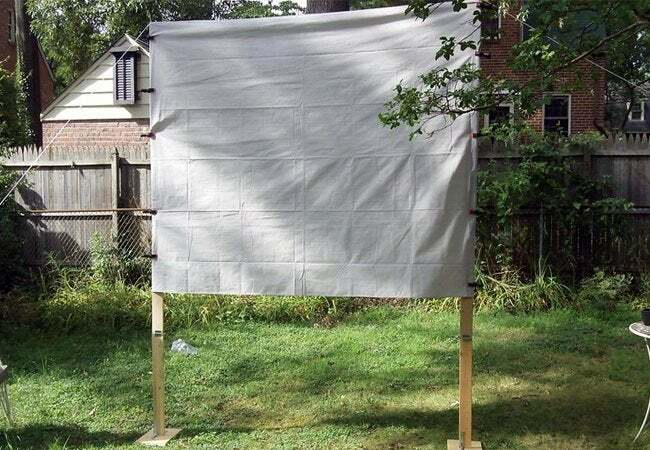 To inspire your DIY outdoor movie screen, scroll down to see five of our favorite designs, any of which you can build in one weekend. Get the popcorn ready, lay a blanket on the grass, and enjoy the double feature! “And the Oscar goes to” white bed sheets for being the least demanding of all DIY outdoor movie screen materials. If you’ve got spare linens, follow the lead of We Lived Happily Ever After. Hannah can show you how she simply clipped a queen-sized, ironed-flat sheet to sturdy bamboo sticks set in the ground. For a larger, sturdier screen, build a pair of wooden posts with help from the step-by-step directions available at Instructables. To stabilize the posts, secure each one with ropes and stakes. Finally, stretch a white tarp (or a blackout cloth) between the two, before locking the material in position with either staples or nails. 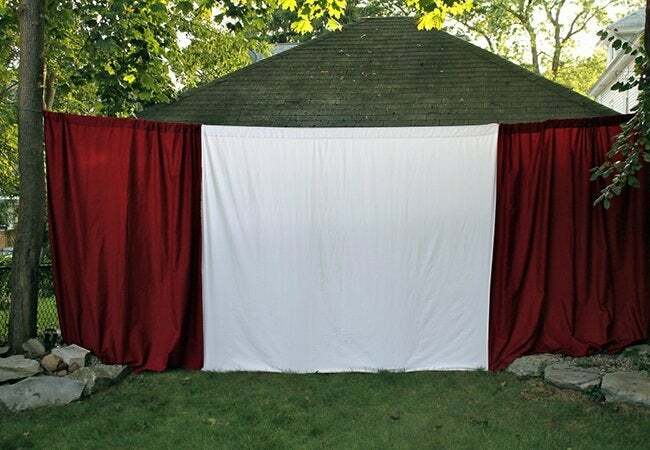 In a woodsy backyard, use the trees to create a wonderfully whimsical DIY outdoor movie screen. First, suspend a rope from one tree to its most conveniently positioned neighbor. Next, hang the “screen” from the rope. The 2 Seasons then took it step further, framing the projection area between wine-colored drapes. Structural elements of your home may provide all the support needed for a DIY outdoor movie screen. Here’s a look at what Sam (from My Barefoot Farm) managed to build in her backyard. She attached her screen (a 10′ x 20′ tarp with steel pipe framing) to the vertical supports beneath the second-story deck. 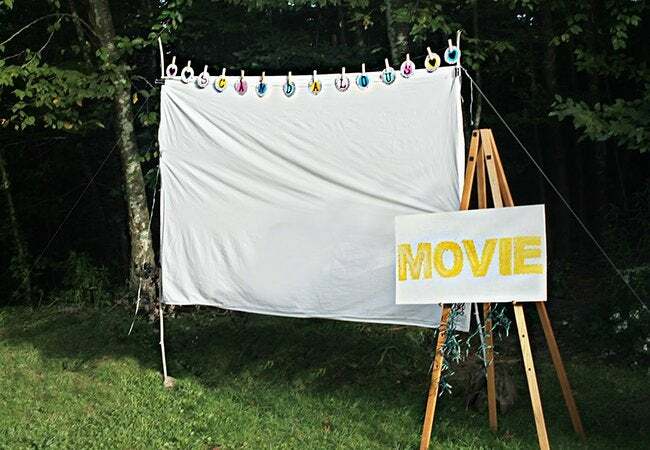 Avid movie-goers, take note: A DIY outdoor movie screen like this one would last long beyond this summer. 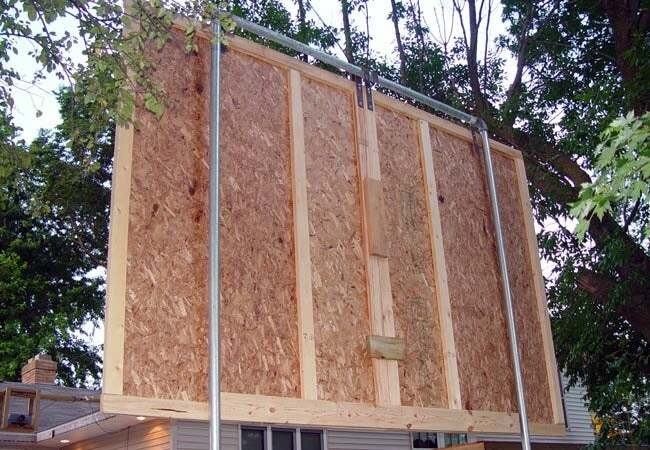 Just paint one side of a plywood panel and support it from behind with a framework of pipe (galvanized steel or PVC). At the end of the season, disassemble it and store the parts in your basement, garage, or shed.